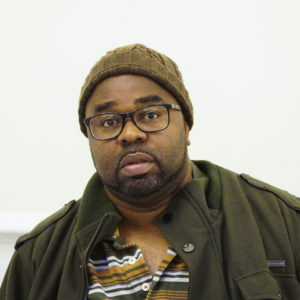 For nine years Orrett Ewen worked as a helper for Sanitation Salvage, a carter that primarily serves customers in the Bronx and is one of the largest in the city. He was required to work for 16 to 17 hours a night, picking up trash at over a thousand businesses. He worked on poorly maintained trucks that often broke down during shifts. Besides falling off of trucks and being hit in the head by broken containers, Owen experienced debilitating fatigue. “There were times when I would be hanging on the back of a truck and not know how I got there,” he says. “My brain was so tired I just couldn’t remember. And the driver behind the wheel was working the same hours that I was. Owen recounts a time he was stuck by a needle that could have been infected. He had to pay out of pocket for antiviral medication and then fight with the company’s insurance to get reimbursed. In the nine years Ewen spent at his company, he was only provided two safety classes. Ewen hopes that the city cleans up the industry soon.